Rick designed the front walkway to our house and at the same time remedied a problem we were having with ponding of water against the foundation. The workmanship and quality of products is near flawless. We get compliments all the time on how fabulous it looks. We will definitely be calling Hofstetter Landscaping again for future projects which we have planned around our house. Thanks for taking the time to write us a review Sandra! 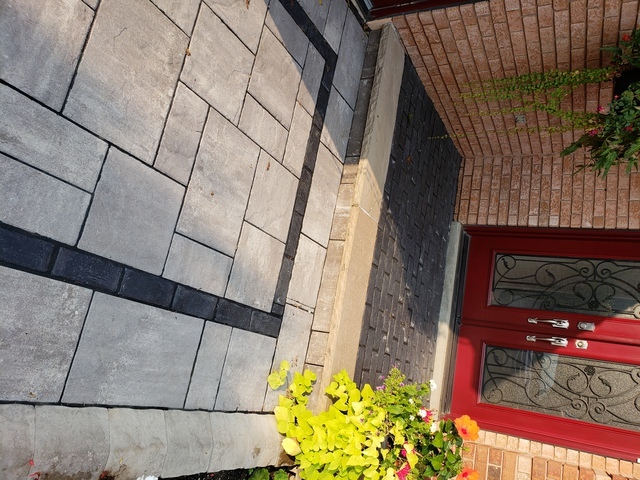 We are happy to hear that you are pleased with your front walkway, and are getting compliments on the completed job. Rick and his team did a great job and in an extremely timely fashion. They were also very respectful and great to deal with. Highly recommended. We are happy to hear that your back yard no longer has pooling water, especially with the downpours we have experienced this summer. We look forward to working with both you and Martin in the future. Looking back at whole project proceedings, we are very happy finding and hiring Hofstetter landscaping company. Not only did they do excellent work, the communication, customer service and help cannot be understated. For large project of this size hiring trusted and experienced professionals is absolutely crucial or .. you know what happens. In fact it took us substantial amount of time to find the right contractor. Thank you Ashleigh and Rick for creating this amazing project for us! Thank you so much for this heart warming review Olga and Vlad. You both worked with Rick to create a beautiful outdoor living space! We hope you have been able to spend a lot of time enjoying your patio this summer! 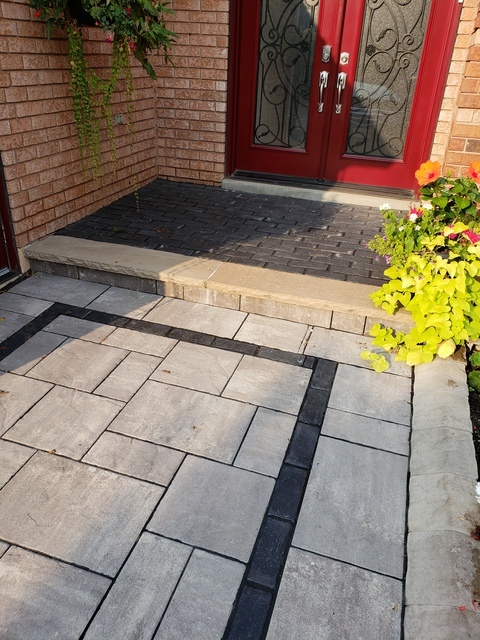 I'm sure it's gratifying to arrive home, and appreciate the curb appeal your driveway, walkway and porch and steps now has. It was our pleasure working with you both! I obtained 3 quotes to install a new back courtyard in my condo. A small job including 4 stairs and courtyard nestled in the centre of my floral garden. Rick Hofstetter was my first call and he had me at hello. Rick’s polite manner and problem solving skills put me at ease and made me feel special when he said no job is too small. Rick patiently measured the area and really listened to what I envisioned. He took the time and made 2 drawings and looked at different stone until we decided on the drawing and stone that fit my budget. Rick’s creativity, expertise and attention to detail and safety resulted in a win win solution for both of us. Ashleigh is the office manager and very professional at being the face to the customer. She is thorough, polite, personable, pays attention to detail, can answer all of your questions and follows up with her customers. The on site crew were fun, experienced professional and artists in their trade. They were constantly examining an re-examining their work making sure it was to the Hofstetter quality standard of excellence. They did a fantastic job. I have recommended Hofstetter Landscaping to family and friends. Thank you for taking such good care of our crew on these high humidity days, it really means a lot to us. 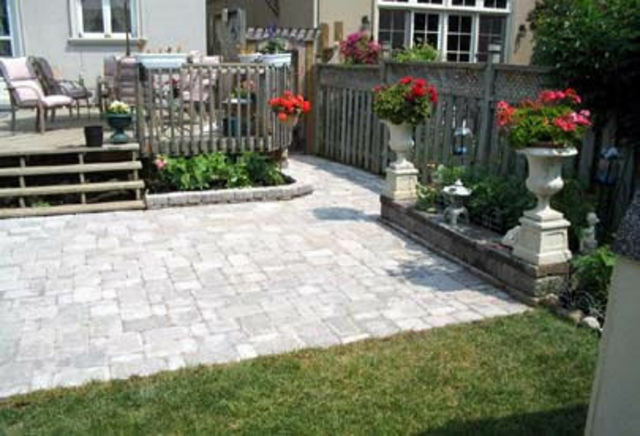 Enjoy your lovely backyard, you still have time to make the most of your patio. Thanks so much Jennifer and Ian, we really appreciate you taking the time to write this for us. We are happy you are so pleased, and we look forward to working with you again in the future! Removal of old railway tie retaining wall / steps and interlocking brick and replacement with new engineered stone retaining wall and stairs. Incredibly fast and efficient work- 1 day removal and 1 day build. The crew was very neat, the job was excellent and the disruption to neighbours was minimal. This was the second job Rick and Ron did for us- the first is still looking good 10 years later. Comforting to know that Hofstetter landscaping is not a 'flash in the pan' but a company with years of experience. I highly recommend Hofstetter Landscaping. It's always a pleasure to work with our previous clients, and to also hear that work we did ten years ago still looks good. Our crews work diligently to ensure the work we do only has to be done once! Rick is a perfectionist, therefore all our jobs have the seal of approval from both Rick and Ron when each job is complete. Have a wonderful summer, and enjoy the transformation of your front! We were happy to get your job done expeditiously! Our crews work independently, with the guidance of our Foreman Ron. We appreciate your review, and look forward to working with you both again! Great service, very knowledgeable, crew shows up when scheduled, stands behind their workmanship. Warranty work is no problem if required, always willing to assist. Thank you Steve and Nancy for taking the time to provide us with such a great review! It was a pleasure meeting you both, and we look forward to working with you in the future with any of your landscape projects. If you get other quotes. Be mindful that Hofstetter takes a bit more time putting the quote together, but that's because they insure that what they quote is available. That's the right thing to do !! Thank you. Truly. More often than not we get referrals from family and friends, in your case, we did your Mom's job 22 years ago. Our reputation and quality of work is second to none, as is our guarantee. 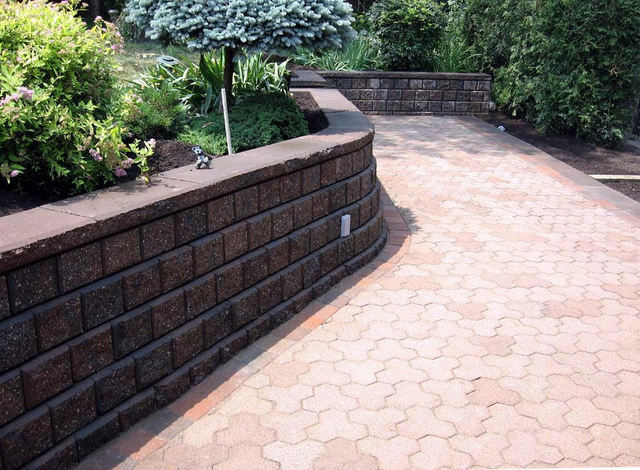 Landscaping Contractors & Designers, Interlocking Stone. From the beginning, we have always endeavoured to do the best quality work possible for our clients. We specialize in landscaping and that’s one of the reasons our “baby” has no siblings—no sister companies, no associates, no partners, no branches. 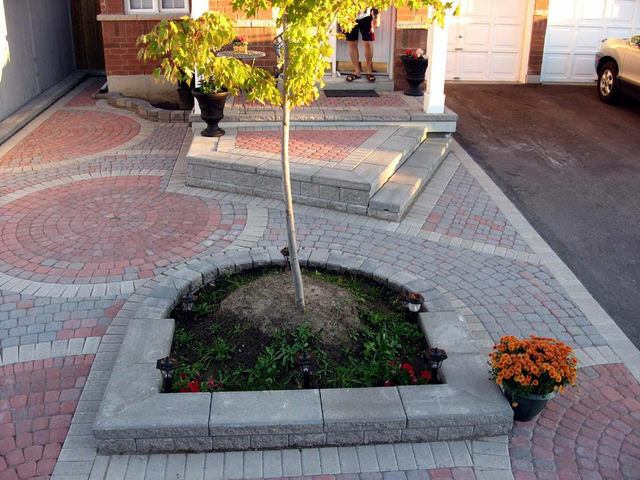 Landscaping is what we do and we do it really well. 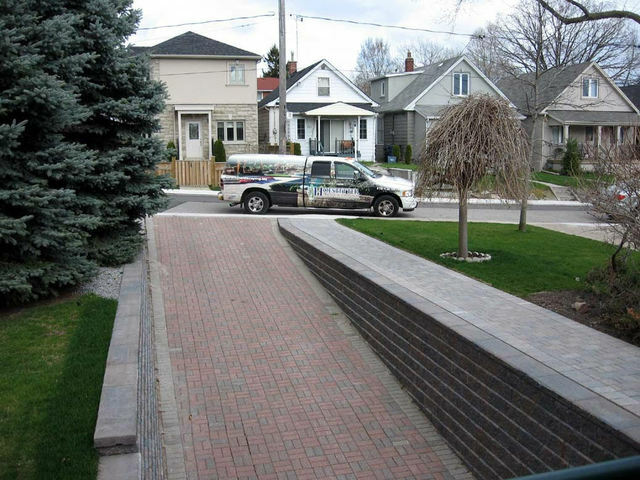 Ever since we started, and even more so now, we find the market exploding with Toronto landscaping companies that make a big noise about “cheap, cheap”. Now, if they were selling birds, it would be okay, but they are not, right? And yet, we often lose a job to a cheap company that “specializes” in being a “Jack-of-all-trades”. Do we want to compete with them? No. But does that mean we are frightfully expensive? Not at all! 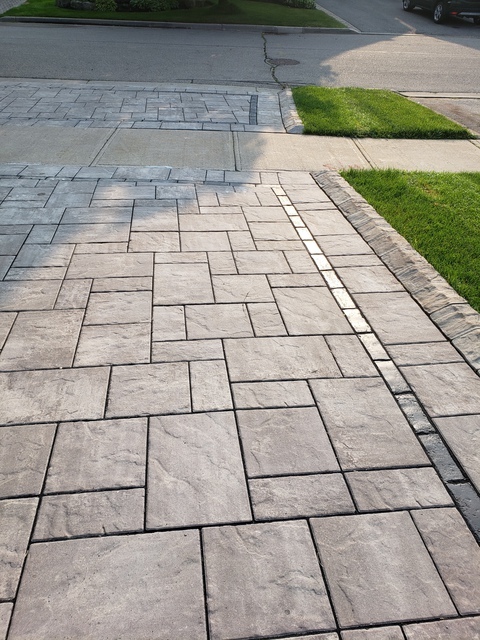 In fact, our goal is always to ensure that our customers get the best value for money and a landscape that makes them the envy of the neighbourhood without breaking the bank. As we come across customers who do their due diligence by comparing quotes, we are very mindful and respectful of the fact that one needs to be price conscious. It’s when we are told about a competitive quote that implies “the other guy” can get the job done for less than it costs us to buy quality materials, the alarm bells go off. He needs a hefty deposit from you to pay his guys for the last job done, and of course, there is always that famous curbside taillight guarantee! All we want to say is this—we do top quality work with a guarantee you can count on, every single time. If it’s not to your liking we'll do what it takes to make it right. We'll be there in years to come, particularly if the weather has given the work a beating. •	We are fully covered with 5 million liability insurance and WSIB approved. •	Our crew is safety certified or they don't work for us. •	Our business has City of Toronto licensing. •	Each team member has government ID. •	We pay our taxes and are an ethical, honest, law-abiding enterprise. 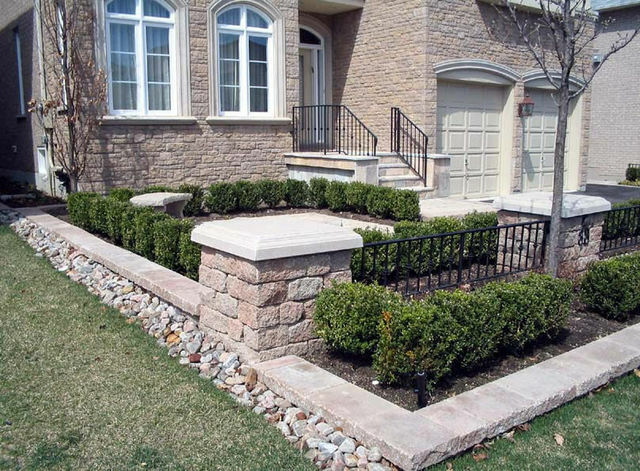 Yes, you will find cheaper Toronto landscaping companies out there. Will you find one better than us in terms of reputation for quality work and customer references? Not likely. 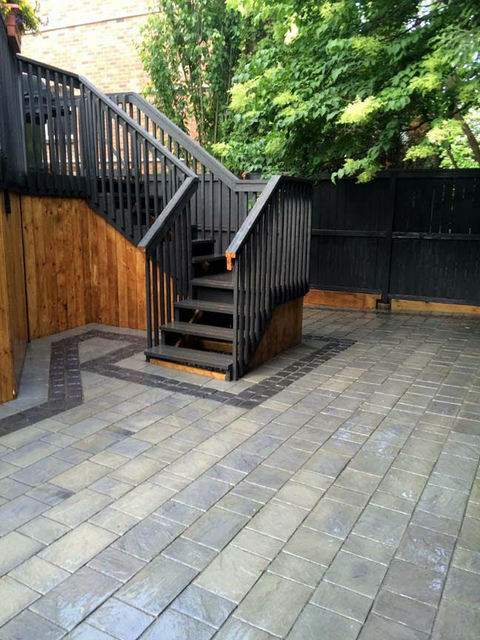 Please visit our website (www.HofstetterLandscaping.com) or call us today at 647-955-8382 to book a free, no obligation landscaping consultation in Toronto. 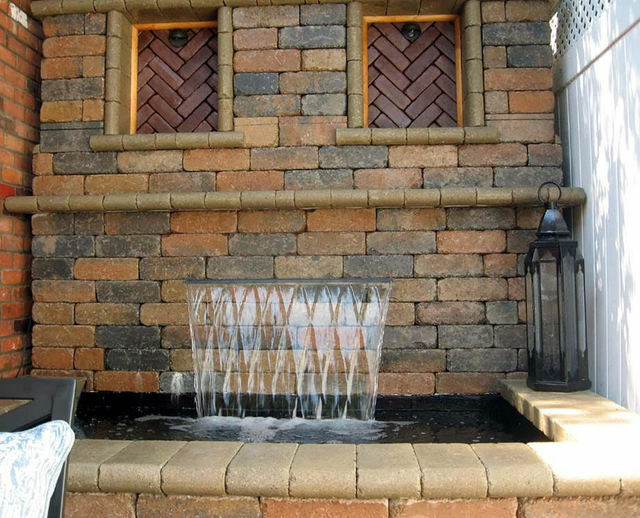 Creating a one-of-a-kind landscape that's a reflection of your impeccable tastes.